After a marathon three-handed war that lasted about five hours, David Peters has completed what he started by leading after the first two days of 2018 Poker Masters $100,000 Main Event, winning the event for $1,150,000. Peters triumphed over Bryn Kenney, Koray Aldemir and then Dan Smith heads up to add to his $4.6 million in tournament cashes in 2018. He bookended the Poker Masters series with wins, first in the $10,000 opening event and then in the Main Event to finish things. 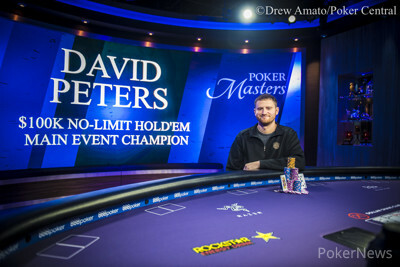 However, despite Peters' fantastic start and finish, he fell short of winning player of the series honors and claiming the Poker Masters Purple Jacket. 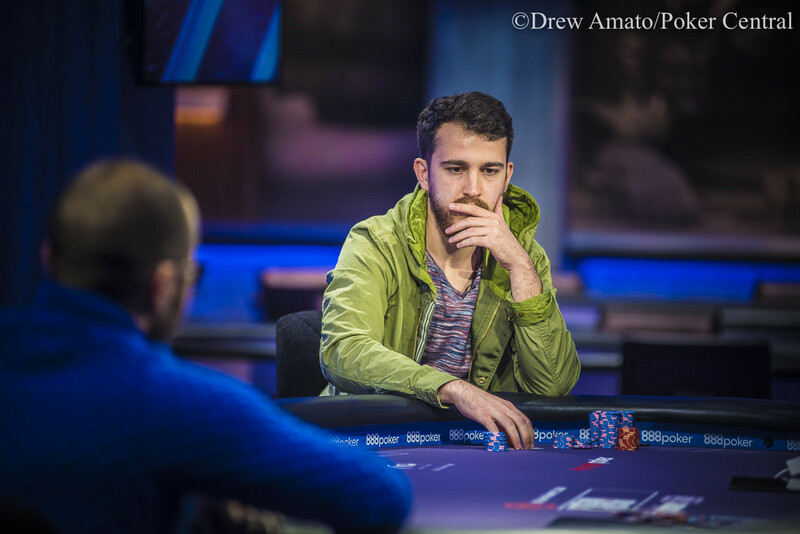 That distinction went to Ali Imsirovic, who locked it up on Day 2 of the Main Event with the elimination of Brandon Adams out of the money at the final table. The final day of the event began with Peters holding a very slight lead over Smith, while Kenney and Aldemir trailed by some distance as just four of 25 remained. Kenney held on to his short stack for a few hours despite failing to find a double but he'd ultimately fall when he jammed a dominated queen-ten into the queen-jack of Aldemir. "I think I did a really good job of transitioning," Kenney would say afterward when asked by Maria Ho of Poker Central about adjusting to being short-stacked. "I played really well. That's all I care about anyway." It seemed a foregone conclusion that Smith and Peters would clash heads up, but it proved to be anything but a certainty. Aldemir found a double winning a flip against Smith and then the three settled into a long grind. A couple of hours later, Aldemir doubled again through Smith in sick fashion. Holding the nut flush blocker, Smith shoved all in on the river over an Aldemir value-bet after the German made top pair of jacks with a bad kicker. Aldemir found the call button and was suddenly worst to first, while Smith had the shortest stack. "I just thought he doesn't have it," Aldemir told Ho with a chuckle when she asked him about the big call. Just after that, Aldemir was one card from a dominating lead. At 20,000/40,000/40,000, Smith opened on the button for a min-raise and Peters ripped in 1.5 million with ace-ten. Aldemir woke up with nines and the race was on, with the nines looking great on a dead flop. Peters picked up outs with a gutshot to Broadway on the turn and he made the straight on the river to surge into first with over 3 million out 5 million in play. Aldemir nearly secured a valuable ladder worth $300,000 when Smith check-raised all in with second pair and a backdoor straight draw and Peters called with top pair. The runner straight came in, however, and Smith moved back to 2 million. The German dwindled from there until he lost the last eight big blinds to Smith. "I have to admit I'm a little bit disappointed," Aldemir said. "I thought I made a couple of mistakes today. I wasn't super happy with my play." Aldemir nearly pulled off a fantastic comeback. After 175 hands, the match that everyone expected at the start of the final table was a reality. The two players quickly agreed to speed up the structure. They were nearly even to begin with but Peters got the advantage early when he made top pair in a three-bet pot. He rolled from there against his fellow American, helped by another big hand when he flopped the nut flush with ace-nine. Smith would lose the last of his chips on a bad beat as Peters turned a three-outer with king-seven against ace-seven. After the match was over, Ho asked Smith about getting to the end of one of the toughest fields in recent memory, 25 players very heavy on the best pros in the world. "The games are really tough," Smith allowed. "It's quite a challenge." As for Peters, known as one of the most consistent and active grinders, he admitted it was grueling going from the win to a drought firing off $25K and $50K shells to another win over the course of more than a week. "It was definitely a long week," he said. "A lot of battles with a lot of great players." Hand #197: Dan Smith limped the button holding and David Peters shoved his big blind holding and Smith folded. Hand #198: From the button, David Peters shoved all in for 3,780,000, and Dan Smith quickly called for his 1,140,000 total from the big blind. Smith was at-risk, but in dominating shape, and when the flop fell, Smith furthered his advantage in the hand. Unfortunately for Smith, the dealer burned and turned the on the turn to shift the advantage to Peters, and when the completed the board on the river, Smith was eliminated in 2nd place for a $700,000 payday. 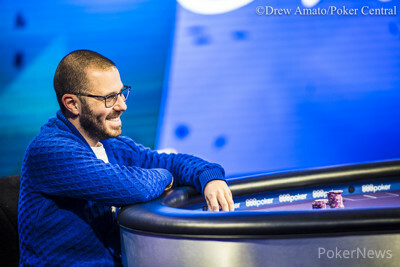 For Peters, he would collect the $1,150,000 first prize, and his second 2018 Poker Masters title for the series. Hand #194: David Peters raised to 165,000 on the button with and Dan Smith called with . The flop fell and Smith checked to Peters who flopped the nut flush. Peters continued for 125,000 and Smith called. The paired the board on the turn and both players checked to the on the river. Smith checked again and Peters fired another 225,000 which got Smith to fold. Hand #195: Smith opened to 135,000 on the button with and Peters three-bet to 430,000 with . Smith instantly folded and Peters dragged in another pot. Hand #196: Peters limped on the button with and Smith shipped all in with . Peters instantly folded and Smith picked up a pot. Hand #190: David Peters limped his and Dan Smith shoved all in for 1,890,000 from the big blind with and Peters folded. Hand #191: Dan Smith raised his button to 150,000 with and collected the pot. Hand #192: David peters limped the button with and Dan Smith checked his . The flop landed and both players checked to reveal the on the turn that they each checked through to reveal the on the river. Smith announced a bet of 225,000 and Peters called to pick off Smith's bluff. Hand #193: Dan Smith limped in with his and David Peters raised to 240,000 holding and Smith folded. Hand #186: David Peters limped on the button with and Dan Smith raised to 200,000 in the big blind with which got Peters to fold. Hand #187: Smith just called on the button with and Peters checked his option with . The flop came and both players checked to the on the turn. Peters led out for 130,000 with his combo draw and Smith mucked his cards. Hand #188: Peters just shipped all in on the button with and Dan Smith peeled his cards before making the call. Smith revealed and was in great position to double up. The flop fell which gave Peters a pair of nines but he still trailed the pocket queens of Smith. The turn was the which changed nothing and the on the river secured the double up for Smith. Hand #189: Smith limped the button with and Peters checked his option with . The board checked down to the river and Smith collected the pot with his queen-high. Hand #182: David Peters limped the button with his and Dan Smith checked his in the big blind. The flop landed and both players checked to reveal the on the turn and both players checked again. The river fell the and Smith bet 125,000 and Peters mucked. The players headed on a short break. Hand #183: Dan Smith limped the button holding and David Peters raised his to 200,000. Smith folded, and Peters collected the pot. Hand #184: David Peters limped the button with and Dan Smith checked the big blind with . The flop landed and Smith check-called a Peters bet of 50,000. The turn fell the and Smith checked to Peters who bet 200,000. Smith folded, and Peters collected another pot. Hand #185: David Peters received a walk in the big blind.